Wow! 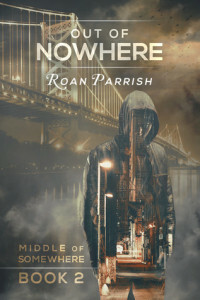 This is an incredible second book by Roan Parish. I love the way it ties in with and moves parallel to the brilliant In the Middle of Somewhere. Colin is the brother of Daniel from the first story. He wasn’t a very likeable character in the first book and even with him narrating this story, I found it very difficult to like the miserable, closeted man trying desperately to please his father in his mid thirties. Rafe is the opposite. I fell in love with him on sight. In contrast to Colin, he seems too good to be true until much later in the story when we learn some of his secrets. I loved the tentative friendship that develops between two very different men. Colin’s world is very small at the start of the story and Rafe offers him a world of new experiences. I also loved watching the relationship become more balanced near the end of the story as both men became comfortable with their identities. The timeline in this book overlaps the first story and I loved watching the same events from a completely different perspective. The relationship between brothers is tense and bitter for most of both books and Colin’s perception of his family is much different than Daniel’s. Roan Parish is fast becoming a favourite author. This feels a little bit more polished and a little more complex than the first story and I’m excited to see her develop as a writer. I’m not sure if this could stand alone, but I’m also not sure why anyone would want to miss the first book in the series. Read them in order and enjoy! I loved the first book in this series and I couldn’t wait to jump into this book. I have to be honest and say that Colin got on my nerves, A LOT. He is in his late thirties and acts like a teenager. It literally drove me to put the book down several times because he is so immature at times. The constant fighting also got to me, I mean I get it, but sometimes a little sweetness would have been nice. Rafe is so patient, he has gone through his fair share too. The chemistry was so good but the constant fighting and Colin pushing Rafe away was a little much for me. I did love the kids at the YA, they were a hoot!